Within the beliefsystem of Aboriginal Australians, a songline, also called dreamtrack, is one of the paths across the land or sky which follow the route taken by so called creator beings during the creation of this world. The paths and landmarks along the way have since been narrated through song, dance and painting. When singing these songlines in appropriate manner and order, the indigenous are capable of navigating along far distances. The continent of Australia harbors a vast network of dreamtracks, some are a few kilometers long while others travers passed hundreds of kilometres through different lands and indigenous communities. Interestingly, since the songline can span the lands of different native language groups, they are often divided into those different languages, so this is not a barrier for them to understand what direction to take, it is rather the rhythm of the song that determines the route, representing an overarching language that connects all the Aboriginal people in Australia. Therefor, both many anthropologists and archeologists are convinced these Dream Tracks are not only significant as land maps or for the transfer of knowledge and local mythology, they are also said to represent prehistoric meaning for (genetic) exchange and communication over long distances. Take the Star Dreaming Story of the Seven Sisters as an example. This story is one of the widest distributed amongst ancient songlines of Australia, tracking over half of the continent from the Central Desert up until the west coast. Observed from central Australia, the Pleiades star group rises above the horizon soon after sunset and keeps a low trajectory. Perhaps for this reason, such a small star group was given such significance, as it appears to launch from the earths’ surface right above the land. However, in many ancient traditions, the mythological story of the Pleiades was narrated through the journey of 7 beautiful sisters, each representing one of the constellations’ stars. Similar stories of 7 sisters were told in ancient Greece, the Americas and Siberia. 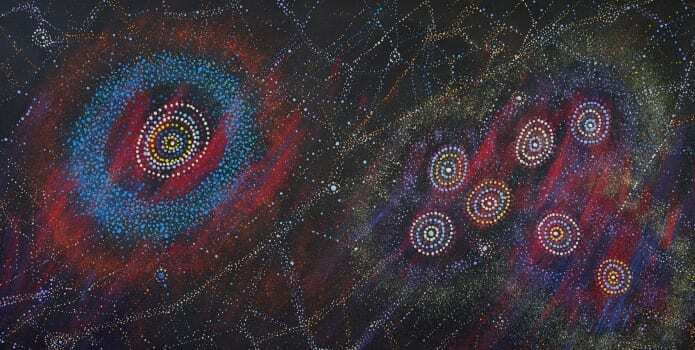 In the Seven Sisters story of Aboriginal Australia, the group of stars are Napaljarri sisters being chased across land and sky by Jukurra-Jukurra (the morning star), a Jakamarra man in love with the seven sisters, specifically fixated on the oldest sister. When on Martu country, where the seven sisters take humanoid form and live on the ground, they’re known as Minyipuru. As they travel further east and decide to fly through the sky to escape their lustful pursuer (and at times avoid country belonging to others), they switch languages and become known as the Kungkarangkalpa. New and gripping episodes in this lengthy saga come into being as the pursuit, escape and journey unfold. Like all Aboriginal creator beings, the man has the capacity to shift shape, transforming himself to lure his ‘prey’ into coming closer to him. In various guises – as an edible snake, or a shady tree, or as temptingly delicious fruit – he devises strategy after strategy to bring the women under his control. But the women too have the ability to change shape and form, so on occasion they become rocks, trees or flowers to avoid his unwanted advances. Although he succeeds once in hoodwinking and brutalising the eldest sister, causing her to become dreadfully ill, ultimately the sisters, in a convincing and intelligent expression of female solidarity, outwit their antagonist. Human beings have always looked for a correspondence between micro and macro- cosm in order to find spiritual explanations for natural phenomena and their interpretations often show striking similarities across different times and geographic locations. Ancient civilisations of all the world have analogous stories describing the origins of the Pleiades; it seems that different and distant cultures have created similar motives in a similar synchronic way. It seems the Pleiades are the meeting place in the skies of mythology and science and most earth peoples consider them as centres of divine feminine energy. From time immemorial this group of stars is associated with festivities, rites and solemn ceremonies, especially at midnight on 17th November when the Pleiades reach their culmination: in ancient Egypt in honour of Isis; in ancient Persia in that night no petition went unheard; Druids and Celtic Priestesses led midnight rites and auspices, in connection with the midnight rising of the Pleiades; similar to the Aboriginal Dreamtime, in Greek mythology the Pleiades are a group of virgins who flee from Orion the hunter and are akin to the doves of the rock (péleiádes) into which they transformed in order to fly in the sky. Frolov articulated his observation about 35 years ago, when the dominant conception held that hunter-gatherers before 10,000 years ago were a brutish, ‘primitive’ lot outcast from influencing the rise of civilisation. The only astronomical inclination that model would have allowed would have been a wild howling at the moon. But such views are incompatible with the picture painted by new findings today. While some scholars have theorized that indigenous Australians descended from a separate, earlier migration than that of Eurasian people, recent DNA study published by Nature magazine reports that the majority of non-Africans stem from a single ancestral group of migrants who left Africa approximately 72,000 years ago and eventually spread across the other continents. 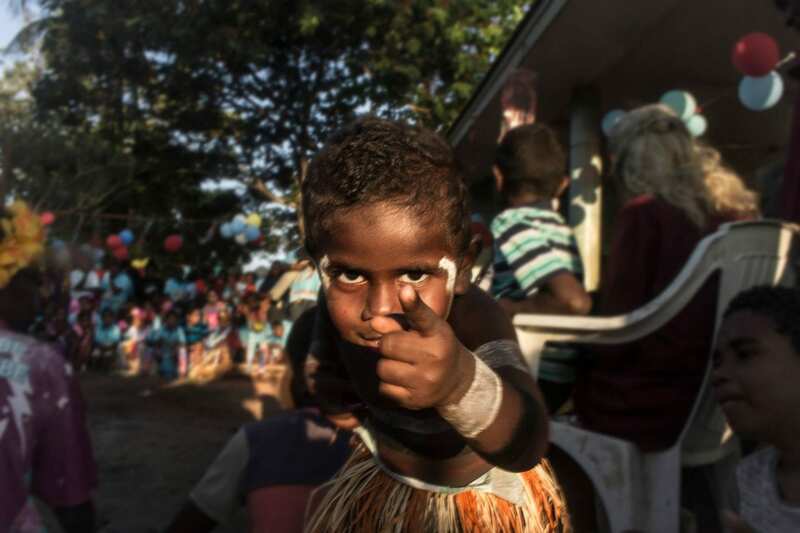 European and Asian ancestral groups became distinct in the genetic record around 42,000 years ago, whilst indigenous Papuan and Australian ancestral groups became genetically distinct 58,000 years ago. Around 50,000 years ago, this wave of migration reached Sahul, a prehistoric supercontinent composed of present-day Australia, Tasmania and New Guinea prior to their separation by rising sea levels 10,000 years ago. At that time, according to the study’s authors, Aboriginal Australians became genetically isolated, making it the world’s oldest civilization.